Winter is extremely luxurious and elegant for the Jason Wu woman, as we discover the flabbergasting Jason Wu fall/winter 2015-2016 collection flooded with opulent fur, fine leather and rich khaki shades. The Taiwanese Canadian fashion designer channels his signature feminine aesthetic through his new fall creations, this time though focusing on daywear pieces more than his mind-blowing evening designs. The pieces target the modern cosmopolitan women, who do their best to look trendy and elegant in this hectic life. It’s a collection for the business ladies and for those in love with simplistic designs embedded with a big dose of femininity. With a great attention to small details, cuts and texture combinations, Wu managed to unveil a collection of outstanding craftsmanship on the second day of New York Fashion Week fall 2015. As the first models hit the runway during the show, we witnessed the establishment of one of the coolest fashion trends for fall 2015: the khaki color. It played an important role throughout the collection from the very first look showcased to the finale of the show. And although you first expect a military style from khaki clothing pieces, we are treated to a femininity overload and polished, elegant looks that center around monochrome designs and interesting texture combinations. 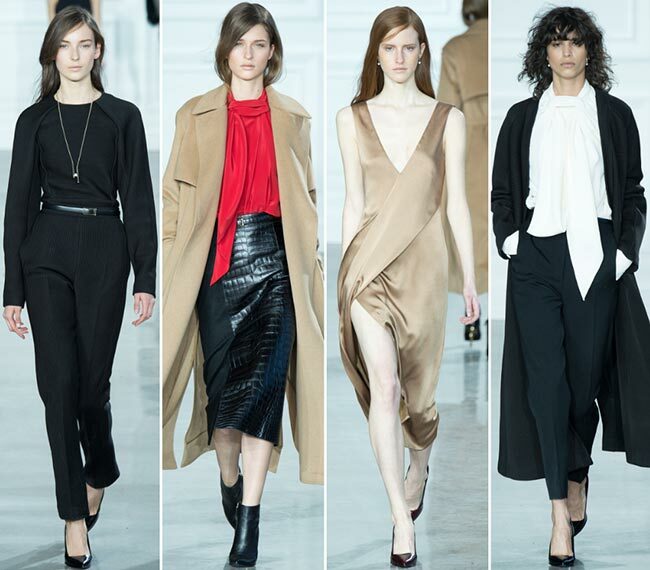 Alongside khaki, the Jason Wu fall/winter 2015-2016 collection brings some charming interpretations of the timeless black, gray, white and beige colors, the latter of which come accompanied with bold red for a contrasting effect. There is absolutely no room for prints and patterns, and we still do adore the beautiful minimalism in the luxury of these monochrome designs. We are head over heels for	the creative use of fur and reptile skin in the collection, which injects a feeling of warmth and luxury to the jaw-dropping outfits unveiled. Fur appears in quite an unusual form in the very first look, being the main material used for a sweater-like design topped with a structured jacket that came worn with a matching below-the-knee length straight skirt with a front slit. Further fur is used as an accessory for a below-the-knee khaki dress decorating its sleeve and being tucked into a thin belt on the waist. The same technique has been used for a furry top coming teamed with perfectly tailored pants cut at the ankle length. We also see luxurious fur coats, one of which closes the collection. 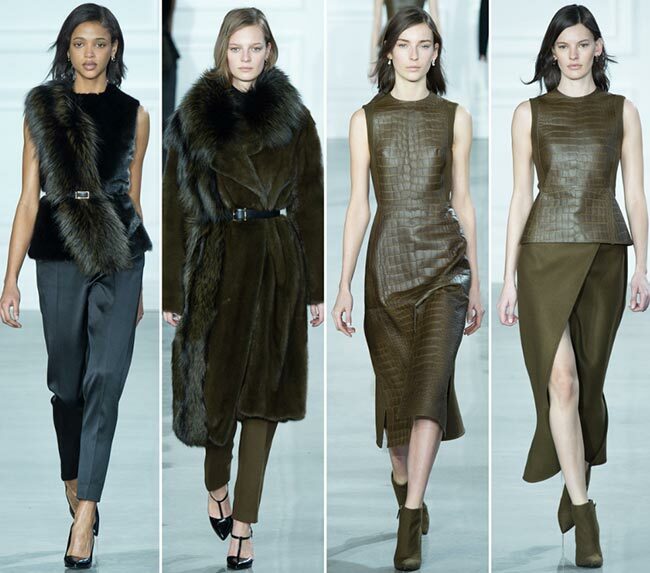 The luxury of the Jason Wu fall/winter 2015-2016 collection is also provided by the crocodile leather pieces, including the sleeveless peplum-style simple top worn with a wrap skirt, the sleeveless khaki dress and the black side-slit skirt worn with a flowing red shirt and a camel coat. If it’s not about luxurious materials and colors, than it’s all the gorgeous structures that keep the high-level attitude of the entire collection. We see some wrap-style dresses with plunging necklines and high side slits that have us enhanced with their flowing and simplistic designs, as well as see-through dresses and monochrome black or white designs perfect for formal events. Effortless and natural is also the beauty at Jason Wu with the hair of the models kept loose and wavy and the makeup barely there. The looks come finished off with thin belts accentuating the waists of the models, classic pumps or ankle booties, as well as chic leather clutches. Should we continue or are you already in love with this mesmerizing collection?